Get a great discount on our Portable Lifeline Grip while the SPRING SALE is on. Once we sell 1000 suction cup shower handle, we will be increasing the price back up to $59.99.
. You will be receiving TWO units for the price of $34.99 while stock lasts. Two powerful high-quality suction grips grab rails provide sturdy support when you get in and out of the tub. No-brainer job to place suction cup hand rails on the surface and push the safety locking switch in just seconds, no need to drill holes in walls or tiles. Compact and effortless removal process, just unlock the switches and move it to a new location. 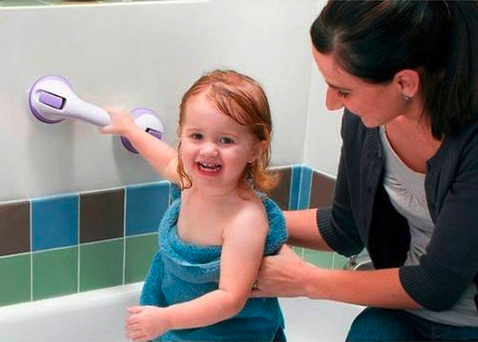 Perfect helper to prevent dangerous slips and falls in the bathroom, toilet, stairs, etc. We will send you 2x Portable Lifeline Grips for the price of one while supplies last! Disclaimer: This product is NOT designed to hold your whole body weight. This is a sturdy and well made item. I am going to be having a knee replacement and my tub/shower requires that I step over the edge of the tub. I purchased this with low expectations but nothing could be farther from the truth. In fact I just ordered two more of these so there will be several points on which to balance. The manufacturer is quite clear that these are not to be used for weight bearing but I can not get this to slip on my fiberglass shower wall no matter how hard I pull. I bought Lifeline Grips to assist my husband getting in the shower/tub after knee replacement surgery since I wasn't sure which would fit best. I have 4" tiles (very smooth ceramic). I mounted one at the entrance and second at the far tub wall. The handle did cross the grout line as seen in photo but I had no problem getting a secure grip. We tested both with full body weight and they didn't budge. We have been using them daily as recommended not expecting them to support full body weight and are pleased. We also make sure to test them before we enter the tub. After my husband recovers I plan to let my mother try these since she sometimes needs help with stability. I'm a big guy, so I wanted two handles to divide the amount of force when I pull myself up from the shower chair. And having two of them helps A LOT.Also, it's nice having them there to help me steady myself when I'm standing up. The cups really grab the hard, shiny fiberglass. Even so, I check them when I first get in the shower. Highly recommended! After slipping in the shower on several occasions, it was time to look for some sort of assistance. My initial thought on these suction cup products was were they really going to be able to hold my 185lbs after grabbing them for leverage to help prevent another slip and fall. SHOCKED!! Not only was I shocked at the gripping capacity of these suction cups, but being so simple to move around is a big plus. It took a couple of adjustments to find the perfect spot for me which would have been a mess using a permanent grab bar. Would and have recommended these truly Life Changing Grip Bars to anyone needing that extra help in the shower or anywhere else there's a smooth surface for the suction cups to adhere to. Great for the grandkids too because of the ease at which they can moved at anytime! These are a product I never thought I would need, a product so strong on tiles, that Samson couldn't pull off! Sadly I'm getting old, stiff, and knackered and am glad these products are made as they are a godsend and they are worth every penny I paid for them, as now I can get out the bath on my own. Recommended? Too right they are buy em don't think oh tomorrow I will do it, there is a time when we have to admit to ourselves we need products like these wether we like it or not! These grab handles are great. No drilling needed they just stick to the tiles. I feel so much more secure now in my shower having something to hold onto if I need to steady myself. I am going to take one of them on holiday next time I go because sometimes showers in hotels are lethal. They are very light in weight, quite sturdy and easy to apply. So pleased I bought them. This little helper is amazing! Locks tightly to tub sides and is strong and safe. I bought 2 and it eases my way out of the new deep soaking tub. Looks cool too! I just feel so much security when I'm in the shower. I don't grab, just knowing I can hold on is wonderful. I put both on my shower wall in different locations. I can now get in and get out with ease. Love this product and they stay in place.